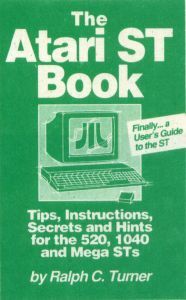 The Atari ST Book is a short, well-written volume full of hints, tips and detailed instructions for getting the most out of your ST. The book is written on a novice level, so it doesn't cover many advanced topics, such as programming. However, it does a nice job with the topics it does cover. The book is arranged into a variety of more-or-less unrelated topics, with each one the subject of a chapter. The organization is a little odd and disjointed. For example, the first chapter is about RAM disks and their advantages. From there, the book goes on to discuss DESKTOP.INF files and the AUTO folder in the context of getting your RAM disk installed. Chapter Two is about files and their management, including the types of files, folders, directories, filenames, wild cards and how to navigate around your disks. A detailed description of the item selector is discussed in Chapter Three, and although the book is dated (as any book will be), Mr. Turner offers specific advice related to products such as the Universal Item Selector (Version 1). Even though Version 2 of this fine product has since been released, the information in the book is still valuable. Chapter Four takes up once again the subject of the AUTO folder, and the succeeding chapters discuss copying (including copy protection and backup products), the control panel, desk accessories and modifying the DESK-TOP.INF file. The book then goes on to discuss public-domain software and installing applications. Again, much of the information provided about available programs is unavoidably dated (there are now better programs than the ones cited), but still interesting. Printers are the subject of the next chapter, which deals with the differences between parallel and serial, as well as dot-matrix versus daisy-wheel printers. Admittedly, this is basic stuff, but if you don't know it, the material is presented in a personal, friendly fashion. This chapter soon moves on to more complex material; for example, how to set the printer's special features. Also included is a chapter on what must be the most confusing aspect of computers: modems and telecommunications. The entire chapter is presented in a question-and-answer format, which makes it a little hard to follow; but again, there is a lot of good information here. The chapter on word processors discusses many of the features that different word processors have, as well as expounding Mr. Turner's opinion of what constitutes a desirable feature. Of course, since word processors all do things differently, this section is not very useful (you'll still need to read the manual that came with your word processor), but at least it gives a fair indication of what to look for before buying. Specific available word processors are covered, with discussion of the strong and weak points about each. Oddly, although Mr. Turner included such offerings as Microsoft Write and Regent Word II (which have hardly taken the ST world by storm), he left out such strong contenders as WordUp and Timeworks' Word Writer ST (likely the most popular of commercial word processors for the ST). The next-to-last chapter handles miscellaneous subjects, covering a wide range, from selecting an item in an inactive window to what to do about hooking up two monitors. Mr. Turner's opinions tend to be somewhat biased. For example, he suggests buying the Practical Solutions Monitor Master. Fair enough, but what about competing products, such as Astra's SW2? One of the shortcomings of this book is that when discussing products for purchase, it mentions only a few (and not always the best) of the choices available. The last chapter, on Chess, is less than two pages long and gives a brief overview of two chess programs available for the ST. The appendices list the names of many magazines for the ST, although a large number of these are no longer in publication. Overall, this is a good book, especially for beginners. An experienced hand (like yours truly), however, will be surprised at how much new information is here; many of the tips and shortcuts are handy. The organization could be better, and the switching between narrative style and question-and-answer style chops up the book. The illustrations are amateurish, featuring handwritten notes on screen dumps. To be fair, though, they do get the message across. You should check this book out.